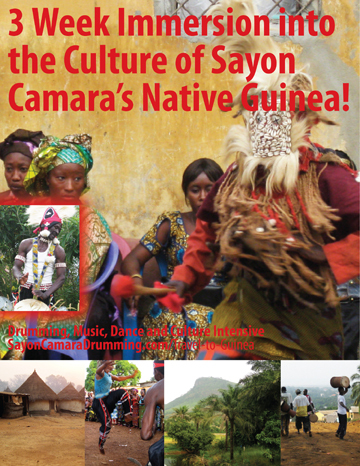 Sayon Camara is a superb teacher and master djembefola performer of the traditional Malinke, Guinean cultural music, song, dance and story. You can register and get the details for this intimate workshop with Sayon that precedes a great day at the Eastern MA Rhythm Festival here and now, to get the early bird price that ends this Thursday night 8/20 at midnight! See you in MA!!! Sayon has a lot to offer this summer! Take a look at his Calendar to find out all the places you can learn with Sayon or watch him perform! 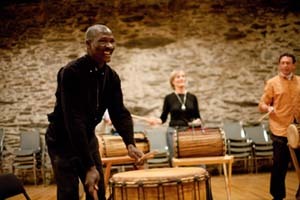 Dynamic Duo: Sayon Camara and Namory Keita Teaching Together in One Workshop! Early Bird Registration for only 24+ more hours! Ends tomorrow (Friday) night!